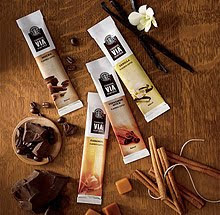 Have you heard about the new flavored Via at Starbucks? Neither had I until late last week when Chris and I made our usual end of the week stop and were warmly greeted by our favorite baristas with samples. So we tasted and truth be told, were quite impressed. In my humble opinion, Via is great in a pinch. I especially love it when I get that rare, mid-day need for a warm cup of coffee (when green tea just won't do). I just whip one out of my bag, pour half a packet into a steaming cup of water and viola! So I was definitely excited when we tasted the caramel flavored Via and found it pleasing to my tastebuds. Though I should caution, while you don't need to add any addditional sweetener, one little packet contains 13 grams of sugar. And even though it's real sugar and not that artificial junk, one should still remember that the moderation rule applies here. But at only 60 calories, it is still a better alternative than say a tall non-fat caramel macchiato! I did in fact purchase a package of the caramel Via, for those times I just must have a caffeinated treat:) Next time you're at Starbucks take the baristas up on their offer to sample the new Via, maybe you too will be impressed!